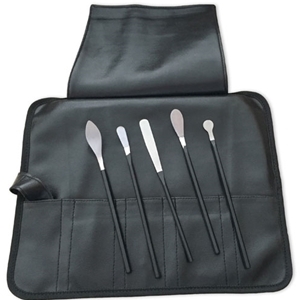 This set of uniquely-designed encaustic wax painting tools includes five (5) spatulas of various shapes. Each tool has a pentagonal steel handle for easy gripping. Smoothing, scooping and cutting techniques are made easier with these flexible spatulas. These tools have been specifically designed for use with encaustic wax paints but are also popular with clay modeling materials including Plastilina, self-hardening and moist clay. Each tool is approximately 7 ¾” in length. Complete set in leatherette roll for clean storage.